The present book Chemistry (XI Std.) is written strictly as per the "core curriculum" accepted by Central Board of Secondary Education (CBSE) and also by Medical Council of India. 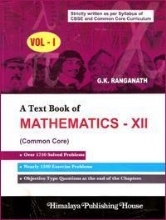 A large number of illustrations, examples, solved numerical, exercises and multiple choice questions have been incorporated to make the students feel at home while going through the book. With the upgradation of the syllabus of Chemistry of XI Std. − State Board to the CBSE level, the book will be useful to both, CBSE as well as State Board students. Special care has been taken to present the contents in an easy-to-understand language. As the syllabus has been accepted by Medical Council of India, adequate conceptual background and the required depth in every unit is reached, to make the students competent enough to face the challenges of various competitive examinations after +2 stages.